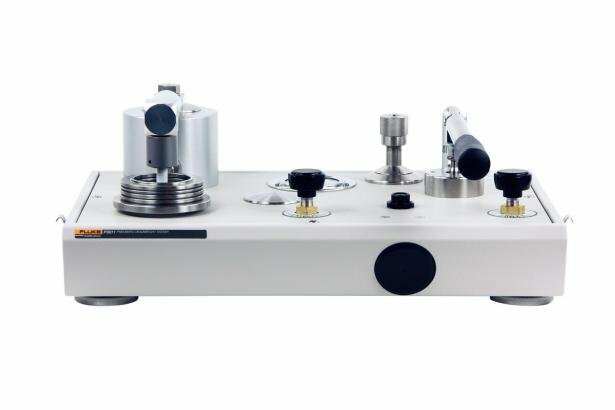 This versatile instrument provides calibrations from 1-30 inHg vacuum (0.03-1 bar) and 3-500 psi (0.2-35 bar) in one extremely accurate yet easy to use primary standard. A selector valve converts the unit from pressure to vacuum mode without the need to exchange pistons. Units are manufactured to the highest standards with certified accuracies traceable to International Standards Laboratories such as the National Institute of Standards and Technology (NIST). These piston/cylinder type pneumatic standards provide excellent stability, repeatability and accuracy. An optional built-in hand pump can be added for both pressure and vacuum generation. 1. Accuracy based on % of reading from 10% to 100% of the piston range when used in accordance with the corrections found on the calibration certificate. Below 10% ± (accuracy class) x 10% of the piston range. Krytox As operating fluid for liquid lubricated gas operated models.